"I can't explain the pure happiness, confidence and joy i feel right now." Well, I have just completed my 12 week plan and WOW. Thank you to Joe and James for creating Sustain Nutrition and doing all the videos to help me along the way! Massive THANK YOU to my amazing coach Joe Moss, you have supported me, answered questions and generally kept me on track for the full 12 weeks. 10/10 for the full 84 days! 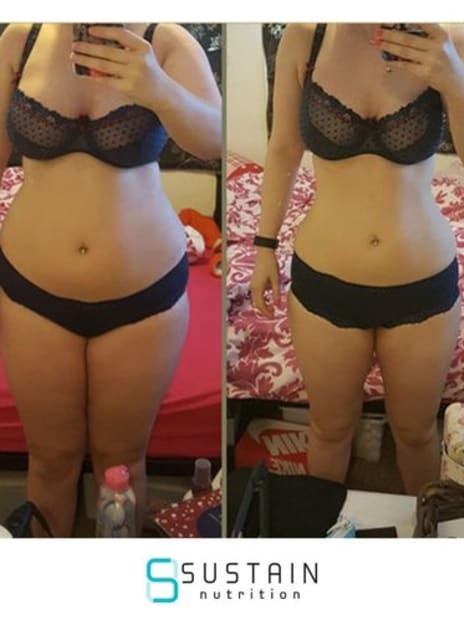 If someone had asked me 12 weeks ago if I would share my pictures it would have been a big NO, but I am over the moon with my results so I’m happy to share! I have loved this plan as it fits into life so easy, I’ve struggled with the no chocolate but my goal dress was way to important than eating any chocolate or cake! And that goal dress now fits which it hasn’t since 2011!! I would/have recommended this plan to anyone, some women at work are getting on the sustain train due to my success as they have seen me do many other plans including BC, SW AND 5:2 diets which have all not worked! I can’t explain the pure happiness, confidence and joy i feel right now. I am not ready to go it alone yet, so I have joined the Essentials plan to help me stayed focused and accountable!! If you are considering doing this plan just do it!!! It works as you can see!! !